Scientists at the University of Leicester have developed a rapid scanning microscope that images without the loss of quality. The new form of digital confocal microscope that can create an image 100 times faster than a regular microscope. 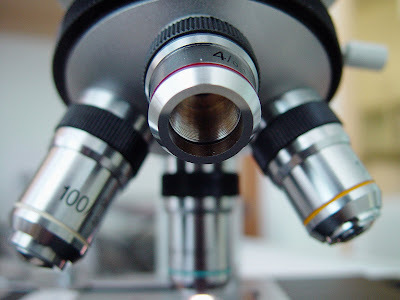 The digital microscope can be attached on to a regular microscope and projects light through a system of mirrors on to the microscopic sample. Mimicking a television, the device projects patterns of illumination onto the specimen, and only light that is precisely in the plane of focus returns along the same path and is reflected by the mirror onto a camera to form an image. The ability to be able to program the mirror device allows the illumination pattern to be adjusted easily for different types of specimens and conditions giving ease of use and flexibility. Unwanted light that comes from regions of the specimen which are out of focus are rejected, improving the image quality. The resulting images can be scanned on a computer at around 100 frames per second, showing biological processes such as cell activity at much higher speeds than regular microscopes - which tend to be capped at around 1 frame per second. The Leicester team's microscope has no moving parts, making it robust, and the use of a programmable, digital micromirror allows the user to alter the size and spacing of mirrors in order to choose the quality of the image and adapt to different imaging conditions. Consequently, it has much greater flexibility than other microscopes capable of similar speeds. The findings are due to be published on the online journal PLOS ONE on August 24. The researchers believe this technology will be a big help to those working in many scientific fields, including biomedical research and neuroscience. The research was led by Professor Nick Hartell, of the University's Department of Cell Physiology and Pharmacology, who plans to use the new device for his own work studying the cell mechanisms involved in the brain's storage of memories. The project last for three years and was funded by the Biotechnology and Biological Sciences Research Council (BBSRC), which has also provided funding for the team to develop the device as a commercial product. Professor Hartell said: "We built the device as there is a 'need for speed'. I found out about this technology from its use in projectors and realised that it could be used to develop a microscope. "Modern biological research, and modern neuroscience, depends upon the development of new technologies that allow the optical detection of biological events as they occur. Many biological events take place in the millisecond time scale and so there is a great need for new methods of detecting events at high speed and at high resolution. "We are very excited because we have been able to go from a concept, to a working prototype that is useful for my research into neuroscience. There is a good chance that we will be able to make a product and see that being used in labs in the UK and worldwide." Neil Radford from the University's Enterprise and Business Development Office adds "This capability provides a breakthrough from traditional Nipkov disk technologies and Professor Hartell is now working closely with us to commercialise the technology with a leading scientific instrument manufacturer."